In 1960 the Episcopal Diocese of Dallas established the mission Church of the Redeemer in North Irving. The area north was open pasture, but now includes the communities of Las Colinas, Valley Ranch, and Hackberry Creek filled with luxury homes, corporate offices, and multi-family residences. The first church home was a Tudor-style house, complete with a swimming pool. It was multi-purposed, serving as our church, rectory, and parish hall, etc. until the erection of the current church in 1965. The founding rector, Father Joe Holyfield, faithfully served the parish through the early years and the financial struggle typically suffered by a new parish. When Father Joe retired in 1972, Father Terrance Roper, a native Englishman whose accent suited the architecture of the parish hall became the rector. During his time, the parish became financially stable and attendance steadily increased. In 1976 Father Roper was elected rector of a larger parish in Dallas, and was succeeded by Father Douglas Eberly. 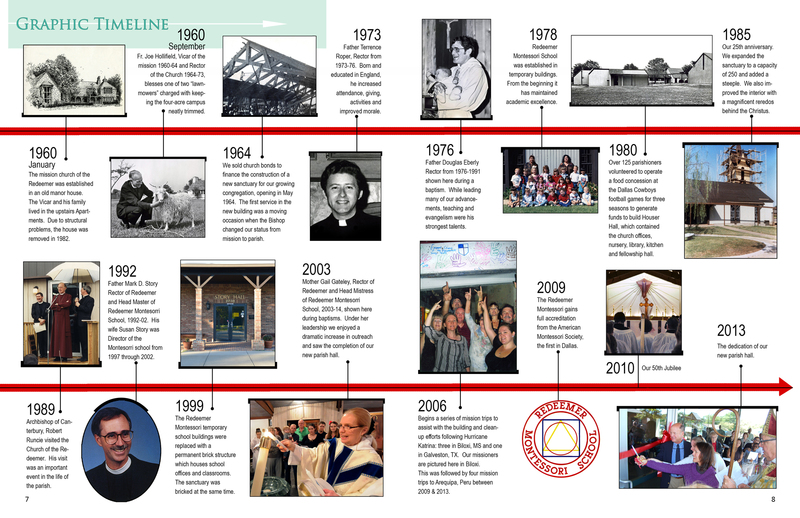 Under Father Eberly’s leadership the parish continued to grow and the Redeemer Montessori School was established and became a vital educational institution for the community and a valuable parish asset. A new parish hall was also constructed, and the old house that had served us so faithfully was demolished due to structural problems. During Father Eberly’s era, we entertained the Archbishop of Canterbury and other noted theologians. Upon Father Eberly’s move in 1992 to a larger parish in California, Father Mark Story was called as the fourth rector of Redeemer. Father Story and his wife, Susan, were instrumental in the continued growth of Redeemer Montessori and the construction of the permanent school building, aptly named Story Hall. In 2002, Father Story accepted a call to a larger parish in Oklahoma. In 2003, Mother Gail Gateley succeeded as our fifth rector. Under her leadership, our participation in outreach beyond our parish walls grew significantly. Mother Gail also played a vital role in expanding our diversity and inclusiveness. During Mother Gail’s time, RMS gained its accreditation. Due largely to her leadership during the capital campaign, a new modern parish hall was erected. Mother Gail recently retired in 2014 opening the position for our sixth rector. In July 2016 the Vestry called The Reverend Canon Victoria Heard to be Redeemer’s Sixth Rector. Canon Victoria officially started on August 22nd, 2016 with her first service on August 28th, 2016.